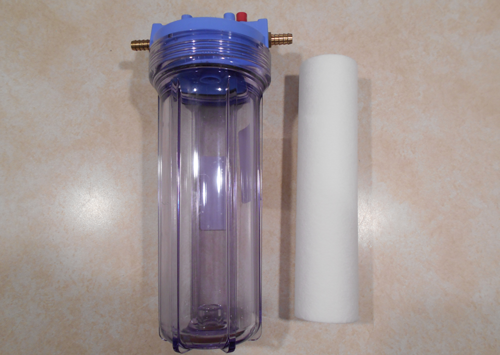 Filtering is an extremely common practice among commercial brewers, but considerably less so for homebrewers. The two main advantages of filtering are time savings, and consistency. 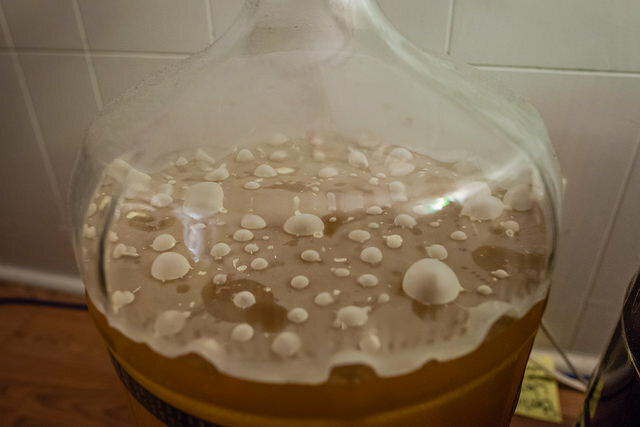 While homebrewers may be content to let their mead sit for a couple months in order to allow time and gravity to settle out all the haze and other floating particles, commercial setups often don’t have that luxury if they wish to remain profitable. All that space necessary to let things sit there can really add up. On top of the time savings, filtering your brew can really add a level of consistency. Racking and relying on gravity to settle out all the sediment always runs the risk of letting some of the particulate stay in the brew. This can happen by it getting kicked up by the racking cane, or your mead having a slight carbonation lending buoyancy to the suspended debris. Filtering can clear that all up nearly instantly, as well as guaranteeing that any particles larger than the filter size will be removed. If the filter size is small enough (<1 micron), you can even be certain that the yeast has been removed, so no re-fermentation can occur when backsweetening; Even without the use of stabilizers. Be warned, filtering isn’t all upsides, however. The filter is indiscriminate in what it is pulling out, as long as it doesn’t fit through the holes. 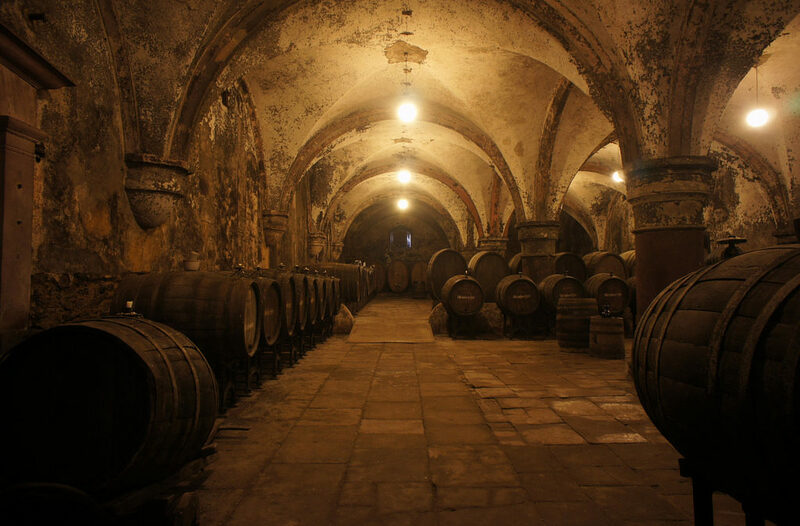 There is a chance that filtering can remove some of the elements contributing to the color, the body, or even some of the flavor of the drink. Some people prefer the taste of unfiltered beverages. Although you should not generally see a negative effect on the flavor unless you are going for a completely sterile end product ( < 0.5 microns). In the end whether you want to filter comes down to personal taste vs convenience. Keeping your filter around the 1-3 micron size is likely to get your mead quite clear clear without invoking too many of the negative aspects. 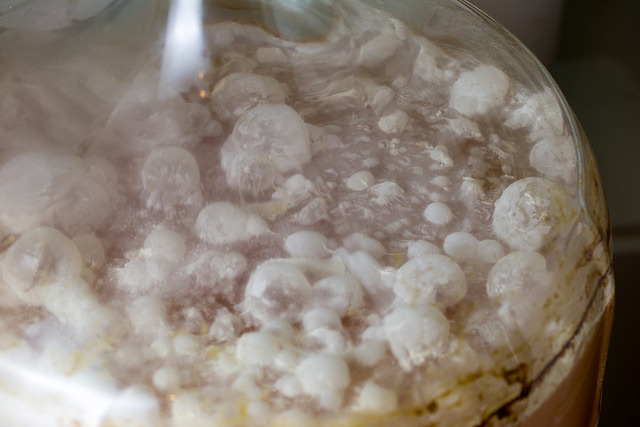 The 1 micron size will actually remove a substantial portion of your yeast, although given that they tend to be roughly that size, many will still pass through, so it won’t be completely sterile. If you are interested in filtering your brew, there’s a few different methods you could employ. All filters work on the principle of forcing the liquid through a surface with a number of small holes. These holes will occasionally get blocked with the debris that does not fit through them. This requires a fair amount of pressure to ensure a consistent flow through the filtering material. The most reliable method is to use a pump and filter device specificity designed for beverages. These are a bit pricier than other methods, but are purpose built to be simple to use and highly efficient at this task. Most of these pumps make use of disposable filter pads, which can be purchased in various levels of coarseness – to filter out different sizes of particulate. 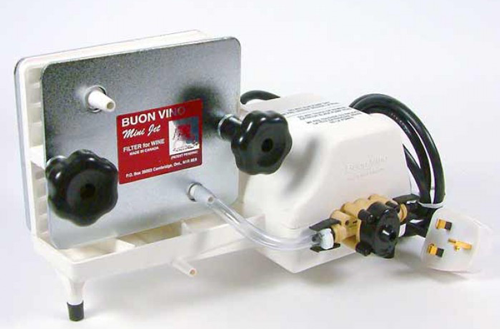 The Buon Vino Mini Jet is a popular model filter for homebrewers. 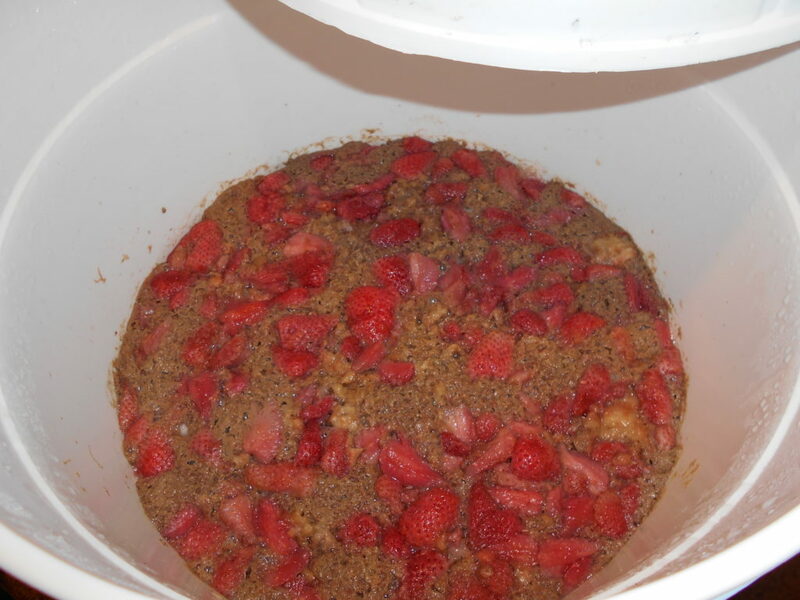 There’s also a bit more of a homemade version that plenty of homebrewers use. It is gravity fed, instead of making use of a pump. It’s not going to be quite as effective, but is probably enough to serve a lot of homebrewers’ purposes. It’s less expensive, but is a bit more work to use. 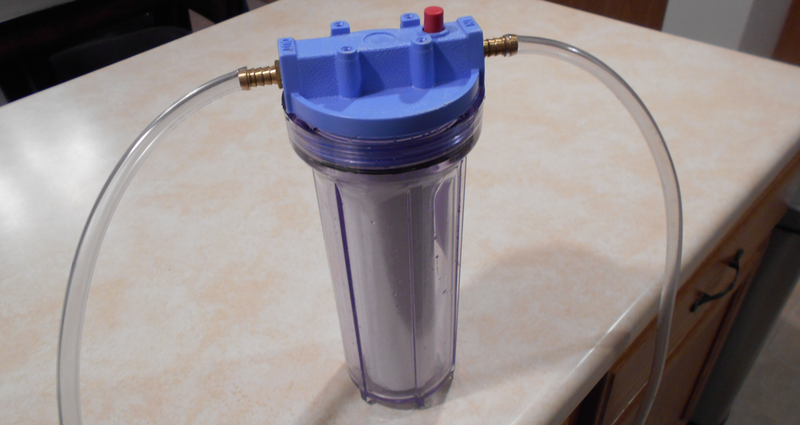 This DIY version consists of an inline water filter housing and the replaceable spun filter cartridges. 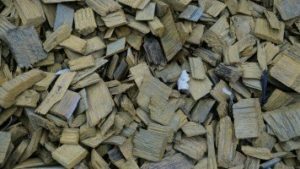 Do not use any filters with carbon in them. 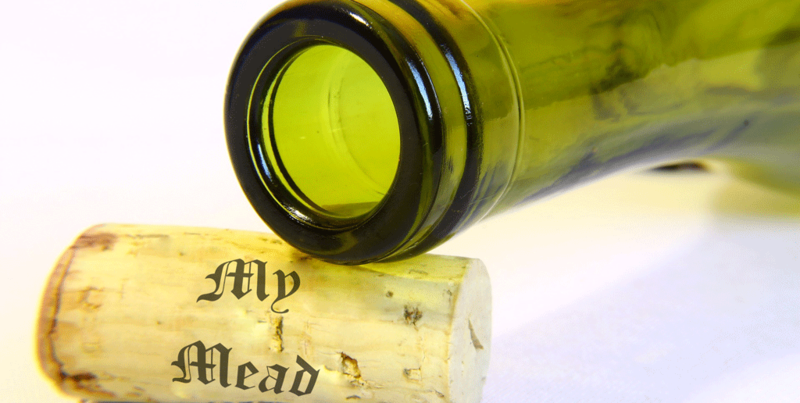 These are not designed to remove particles based on physical size, instead relying on chemical properties to reduce the harshness of tap water – this could affect your mead’s flavor. Also, if you plan to reuse a cartridge, make sure you remove it from the housing and allow it to dry properly. If allowed to stay damp, but not completely submerged, they can start to grow mold on them. You can make use of this filter while racking. Hook up your siphon to a piece tubing that connect to the filter housing on the inlet side, and another to the outlet nozzle that is in your empty container. Make sure everything is nice and tights, if it is at all loose, you will get leaks. You will also want to place the filter at a lower elevation compared to your full mead container, and the empty even lower than that. This will let gravity help move your liquid through the filters. Engage the siphon. The filter housing will fill all the way to the top, and then the pressure will start to build within – between the outer wall and the filter cartridge. Once it hits a certain point, the pressure is enough to force the liquid through the filter itself and up and out of the exit tubing. Once you get towards the end, you may need to tip the filter a bit to get most of the liquid out. One of the drawbacks of this type of filter, is that it requires a build up of pressure to work. In order to have pressure, you need liquid. This means you’ll always have a portion of the brew that gets stuck on the pre-filter side of the housing as there is nothing to push it through. Depending on your goals with the filtering, this may not be the end of the world. And if you’re that concerned, a second round of filtering of your whole batch should get everything through at least once. As a bonus, this same equipment can be reused for another purpose. 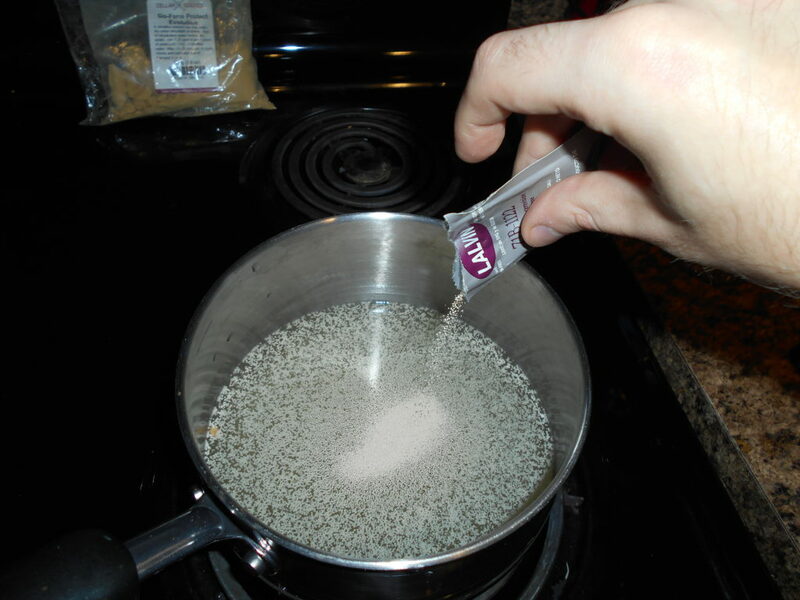 A “Randall” – an in line fresh flavor infuser. 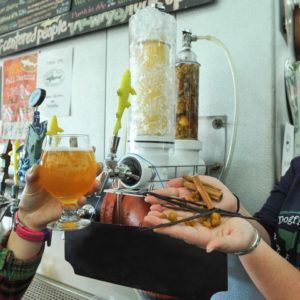 Dogfish Head Brewery is credited with pioneering this type of device in order to deliver a more fresh taste to any herb, fruit or other organic additive you may be wanting to serve directly before your brew exits the tap. Instead of the filter cartridge, you would have a small housing for your flavor additives which the pressure from your CO2 tank would force your brew through before exiting into the tap. “Randall the Enamel Animal” is the nickname of the original device.